WE SEEM TO HAVE AN AFFINITY for Ghent, for not too long ago, we featured a lovely shop there, and now, it's the Maison de Maître, a grand old house which dates from the end of 19th century. Throughout the years, the house had fallen somewhat into disrepair (the rear building was completely deteriorated and lost) but fortunately, many of the space's original features had been preserved. 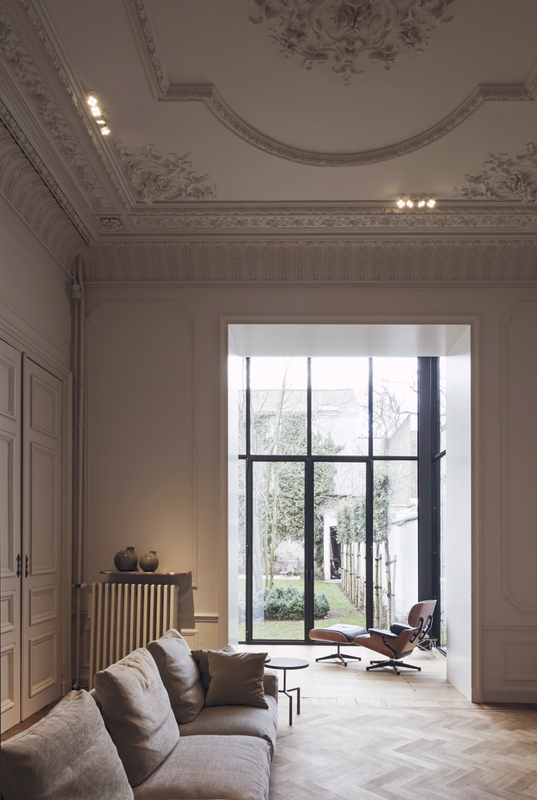 Hans Verstuyft Architects were called to restore the space, which included adding very contemporary elements. The former coach house was turned into a spacious kitchen and the coach entrance, a large hallway. Two steel glazed extensions were also added to house a small porch and a dining room, bringing the outdoors in and acting as solariums. Other additions, including new flooring and an oak ceiling were custom designed by the architect to appear as if they had been there all along. Wherever possible, old paint layers were polished and maintained, letting the old patina shine through, creating a perfect mix of old and new.